Following an upset to Pahrump Valley on March 22, Boulder City High School’s softball team got back on track against Sunrise Mountain on Tuesday, routing the Miners 16-0. Steve Andrascik/Boulder City Review Boulder City High School softball pitcher Bailey Bennett-Jordan prepares to throw the ball to first base before the Pahrump Valley runner in the home game March 22. The Lady Eagles lost the game 8-3. 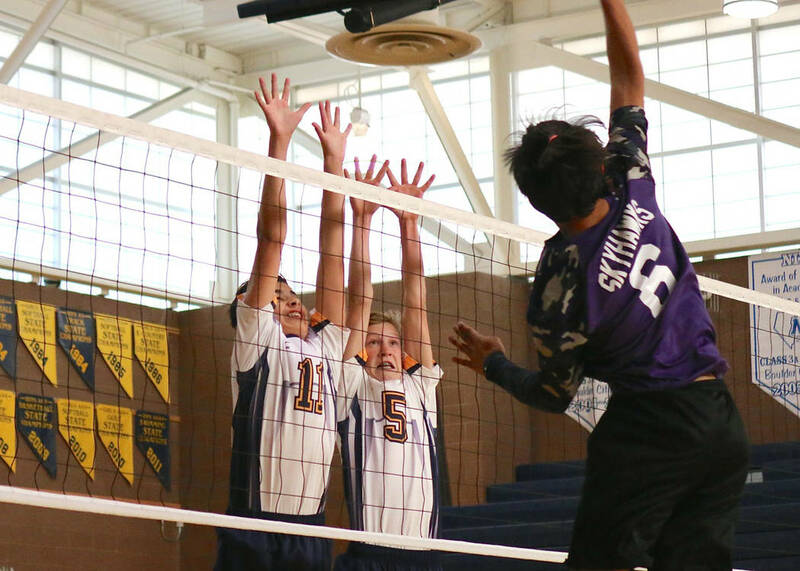 Laura Hubel/Boulder City Review Dylan Mullins, left, and Austin Morris, members of Boulder City High School's new freshman boys volleyball team, defend the net during the Eagles' victory Monday against the Skyhawks. Knocking in 10 runs in the first inning, the Lady Eagles got big contributions from sophomore Marlena Mills, who knocked in seven runners off of a 2-for-2 performance at the plate with a home run. Junior Lily Osman came up big, finishing 1-for-3 with three runs batted in and a triple, while junior Bailey Bennett-Jordan shut the Miners down offensive with only one allowed hit in three innings. 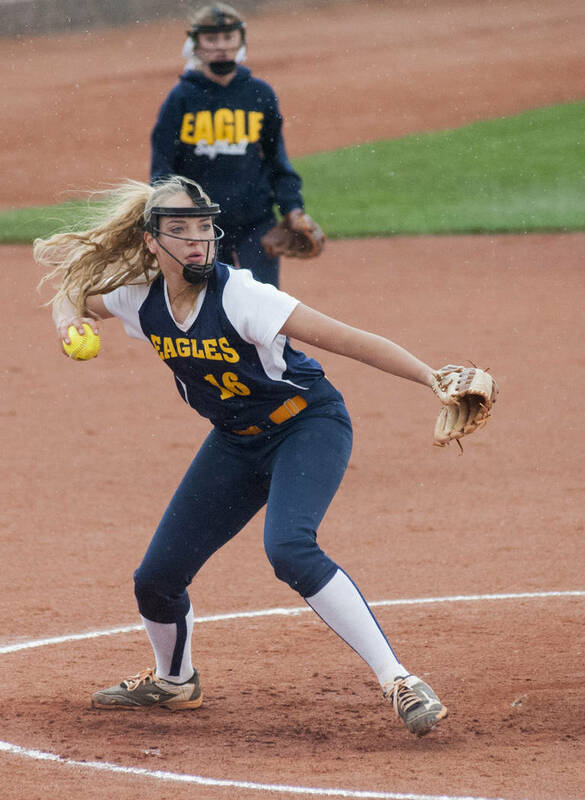 Playing much better offensively Tuesday, the Lady Eagles tallied 12 hits after only collecting seven in their 8-3 loss to the Trojans in a battle of 3A favorites. Giving up six runs in the fourth inning after a minor rain delay stalled Wednesday’s outing, Bennett-Jordan had a rough outing allowing 11 hits, but only allowed one earned run while fanning nine batters. A rematch with Pahrump Valley is expected this postseason. The Lady Eagles host Desert Pines today before starting league play on Friday against Southeast Career Technical Academy. Boulder City (10-5) is the favorite to win the 3A Sunrise League, while Pahrump Valley (10-2) is the favorite to win the 3A Sunset League. Starting league play off strong, the Boulder City High School boys golf program picked up a pair of victories, scoring 428 in match one and 405 in match two. Leading the way in both matches, senior Kyler Atkinson shot a 72 on the par-76 course March 22 and a 73 on the par-70 course on Monday. The Eagles edged out Virgin Valley in both matches. Near the top of the pack in each match, the Eagles placed their entire core inside the top six, highlighted by seniors Samu Jancuk (third place and sixth place), Cade Neilson (fifth place and third place), junior Jackson Wright (fourth place and fifth place) and sophomore Kevin Phelps (sixth place and fourth place). Boulder City High School’s boys and girls swim teams dominated Sunrise Mountain on Saturday at Heritage Park, and are now 2-0 for the season. Cruising past the Miners 170-50, the Eagles placed first in all 11 events behind the efforts of senior Braden Klouse (100-yard freestyle and 200-yard freestyle), junior Clayton Pendleton (50-yard freestyle and 500-yard freestyle) and sophomore A.J. Pouch (200-yard individual medley and 100-yard breaststroke), who each won their respective events. Senior C.J. Herrera placed first in the 100-yard butterfly with a time of 1:12.48, while sophomore Paco Cuevas placed first in the 100-yard backstroke with a time of 1:01.72. Just as dominant against the Miners, the Lady Eagles used their stars this week, racing to a 209-41 victory. Starring in their first race of the season, seniors Mandy Gebhart (200-yard freestyle and 500-yard freestyle), Montana Lloyd (200-yard individual medley and 100-yard backstroke) and Abby Sauerbrei (100-yard butterfly) each placed first in their respective events, along with sophomore Aimee Garcia (100-yard breaststroke). Sauerbrei and Garcia also placed second in the 200-yard individual medley and 100-yard freestyle, respectively. Sophomore Rose Pouch (100-yard freestyle and 50-yard freestyle) placed first in both events. Advancing to 7-2 on the season, the Boulder City High School freshman volleyball team rolled past Basic and Silverado this week. “The boys are playing well and much better than I think anyone expected, especially since they had zero experience prior to the season,” head coach Joshua Fisher said. Defeating Basic on Friday, the Eagles routed the Wolves in straight set 26-24, 25-19, behind the efforts of Boen Huxford and Preston Jorgensen. Using an all-around effort on Monday to grab a come-from-behind victory against Silverado 22-25, 25-21, 15-11, the Eagles gained more of a defensive effort from their starters. Blocking three shots, Huxford led the way with four digs, three assists, three kills and two aces, while Jorgensen added five kills, three digs and one block. Andrew Trupp also had a blocked shot and four digs, while Dylan Mullins added four digs, two assists and one block. Looking to continue their winning streak, the Eagles will host Legacy on Friday. Friday, vs. Southeast Career Technical Academy, 3:30 p.m. home varsity, away junior varsity. Tuesday, vs. Green Valley, at Legacy, 3:30 p.m.
Wednesday, vs. Basic, at Boulder Creek, 3 p.m.
Saturday, vs. Sierra Vista, at Heritage in Henderson, 1:30 p.m.